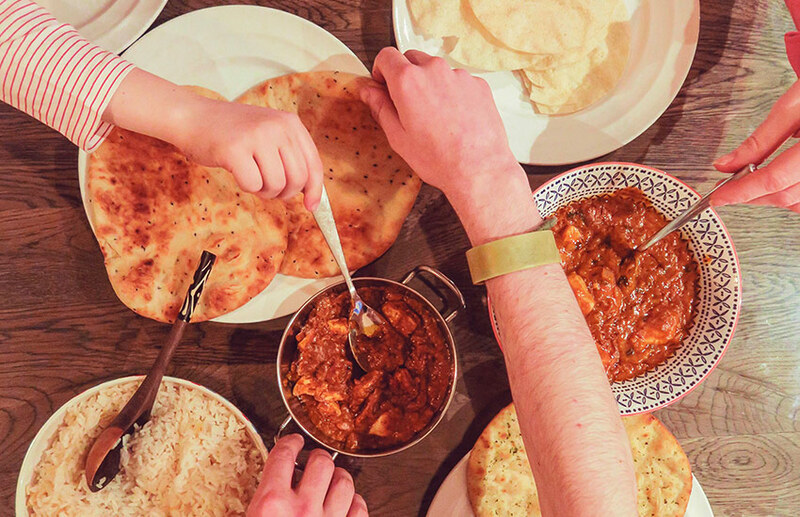 Curry night is always guaranteed to the whole family around the table and we love nothing more than seeing a whole family come together to share a meal. Traditionally in India food is served in the centre of the table. An array of curries, rice, Naan Bread, Pappadums, Pickles and Chutneys make a feast for the eyes. Guests then serve themselves, picking and choosing from the dishes they most enjoy. We couldn’t imagine a better way to get everyone sharing and talking. Naan Bread is a delicious side but it comes into its own when used instead of cutlery. Children love to eat with their hands and this is a great way to get the whole family involved. We guarantee that your children will giggle seeing their parents scoop up their curry with their bread. No meal in our house would be complete without Pappadums, although they often spark debate. Some people snap them and some people smash them. Ask your family how they eat theirs and watch as a raucous display of smashing and snapping happens around you. No matter how you eat them, no Indian meal would be complete without this crunchy accompaniment. Our range of pickles and chutneys go perfectly with Pappadums, but did you know that adding them to your curry can enhance the flavour? Encourage your family to add some Mango Chutney to their Tikka Masala or some Lime Pickle to their Korma and soon everyone will be sharing their favourite pickle/curry combos. We would love to hear how you get your family sharing. Share your tips on our Facebook page. Each curry is inspired by a different region; Punjab, Kerala and Madras and just 3 Steps can take your on a culinary journey.